With that being said, some people never like change. Some will always criticize the new person, but eventually people get used to the new character and find traits that appeal to them and captivate their affections. I was guilty of this when Tom Baker regenerated into Peter Davidson. At first I really missed my scarf wearing, curly hair Doctor, but soon the cricket union wearing Doctor had captured my affection and I was eagerly following to see what his next adventure would bring him. 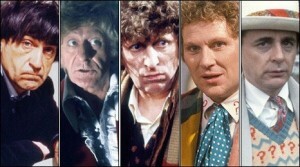 Regenerations are a huge aspect of the Doctor Who series and this is why people are so opinionated when they happen. Posted: 04|13|10 at 11:46 am. Filed under: New Doctor Who, Old Doctor Who.